Jet Airways has prematurely terminated the contracts of 50 of its expatriate pilots as part of cost-cutting measures as well as reducing dependency on the high-cost overseas flight crew. "We have prematurely terminated the service contracts of 50 expatriate pilots between April 1, 2014 and March 31, 2015," Jet Airways acting chief financial officer (CFO) Ravichandran Narayan said during a post-earnings analysts call. He said that as part of the contract obligations, the airlines paid retrenchment compensation to the sacked pilots. After the termination of the contracts of the 50 expat pilots, the Naresh Goyal-promoted airline now has a total of 1,120 pilots of whom 88 are foreign pilots. The country's civil aviation regulator, Directorate General of Civil Aviation (DGCA), has also given the airlines a deadline of December 2016 to phase out the expatriate pilots. 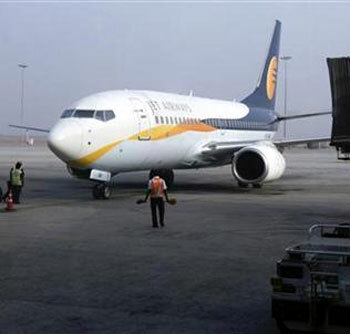 Narayan, while speaking about the measures taken by the airline to contain cost, said Jet Airways has taken several steps particularly in the areas like sales and distribution, engineering and maintenance in this regard. "We are continuously improving our aircraft utilisation by adding more red-eye flights and early hour departures in our schedule," he said. A red-eye flight departs late at night and arrives early next morning. Because of their very low priced tickets, these flights are quite popular abroad, especially in the US and Europe. Narayan also said the airline was in the process of restructuring its overseas hub at Abu Dhabi by rejiging some of the flights and withdrawing a few. "We are restructuring our Abu Dhabi gateway by converting Goa-Abu Dhabi-Goa flight into seasonal one and cancelling the Abu Dhabi-Kuwait and Abu Dhabi-Dammam services," he said, adding the airline has also decided to reduce the frequency from three daily flights to two on Mumbai-Bangkok route from July 15. We continue to rationalise our route network in line with the industry condition and traffic evolution, he added.